Freddie Mac reports a drop in the 30-year fixed mortgage rate to 6.20% during the week ended Nov. 6 from 6.46% the previous week. 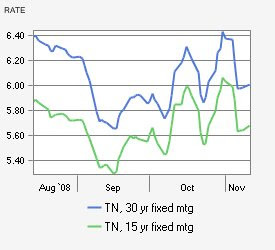 Rates rose the prior week, reflecting volatility as a result of the credit crisis. The 15-year fixed mortgage rate also declined, falling to 5.88% from 6.19%. Meanwhile, the five-year hybrid adjustable mortgage rate plunged to 6.19% from 6.36% and the one-year ARM dipped to 5.25% from 5.38%. We are getting very close to the magic 6.15% rate, the point at which Nashville real estate historically starts moving. It will be very interested to see if this “rule of thumb” applies in our new post greed economy.